Happy Sunday. We are having the best weather. I think Spring is trying to appear. I have been really enjoying these high 50's and 60 degree days. That is above normal for us in Chicago land for this time of year. Hoping this is a good sign Spring is coming. My birthday is next month in April. While Terry and I were out junkin last week end we came across one of these old vintage water bottles and crates. I have always wanted one so Terry said he would get that for me as an early Birthday gift. I put it in the entry way for now. Love this old embossed heavy water bottle and crate. Living in the suburbs of Chicago, I love that it is from the Chicago based Hinkley and Schmidt water company that have been in business for many years. Now they deliver those plastic blue and clear water bottles so to come across this beautiful old piece of history was a fabulous find. I got the chalk boards made up in the old frames in the entry way. I like that I can change up the sayings inside these for the different holidays etc. Hope to have the Living room done this week to show you. Have a wonderful start to the new week ahead. What a great new find, I love where you are using it and the chalkboard prints are perfect. You always do such a nice job with them. It's going to be 55 here today. Im going to finish pruning the old herb garden back, I'm seeing green underneath so that's a good sign. Have a wonderful Sunday! Kris, love that bottle - another item to tie the PB / cottage look together. Your chalkboard art turned out great! I love your water bottle crate! Love the way that you have styled it with the bottle and flowers. You clever girl, you think of everything! Hi Kris. Absolutely love that bottle and crate! Great find. The whole entryway looks wonderful. Have a great Sunday! Love the fresh look of your entryway & your latest find, Kris! We are supposed to reach 60 degrees this coming week ~ come on Spring! That looks beautiful! I have to tear apart my front entry this year to replace the insulation in the attic that I have no access to. At least I have some gorgeous inspiration for putting it back together again! LOVE your new water bottle, Kris...so pretty! And I love how the chalkboards look, too! Oh wow, what a fabulous find. I love your entry and the bottle and crate are so perfect for that spot. I love it and what a great find. 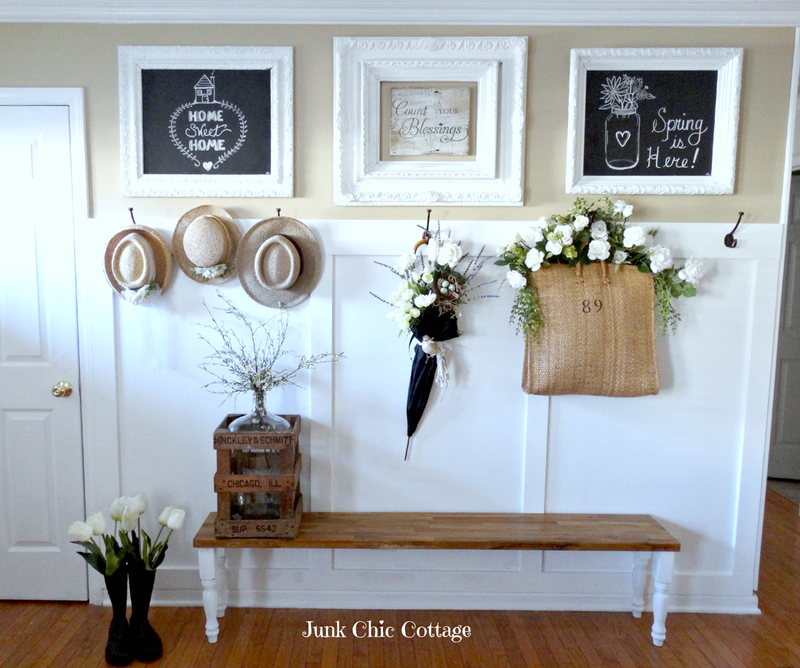 Your entry way looks wonderful and I love the chalkboard's. You should open up a decorating business for people who love your style. I am sure you would be very successful. You have such terrific ideas. So glad that the weather is warming up for you since you had such a terrible winter. We had 96 degrees yesterday - I finally had to turn on the A/C as I was melting. So we will be sending the hot weather your way. I have to tell you a little story - I like petunias but I like perennials better, as they will re-seed. After I saw your stunning petunias last summer, I thought ...hum .... maybe I should plant some. I planted one big stone pot with them - they were a beautiful magenta color.- guess what.... those petunias never died out and are so big and beautiful, so every time I go out to water them - I think about your beautiful petunias and flowers. Have a great week and I am so looking forward to seeing the "NEW LIVING ROOM". How's Terry's job hunting going? What a great piece! Your entry looks great. You have absolutely captured the look and style of cottage meets Pottery Barn. Happy to see the blackboards and graphic punches of Black in the boots and umbrella. Black grounds, add drama and is such a delightful enhancement to add. Love your crate. When we moved in 36 years ago we started a Spring Water delivery to our house. Glass 5 gallon bottles for 31 years the company would honor our request of glass (of course for a premium charge). But now our 5 gallons are plastic :-( I would so love to discover a grate out junkiń one day. We kept 3 of the aqua/blue bottles. Just last week John and I were talking about our kitchen redo and he mentioned imagine an aqua Demi-John filled with Spring water in the pottery well. Well imagine I did and now I'm bugging John to do just that and I'm looking for another Demi-John but this one in Aqua and perhaps smaller than the 5 gallon size. The branches in your bottle/crate look so pretty and promise Springtime blissful. Tell Terry he is one sweet husband. LOVE your early birthday present, Kris!! 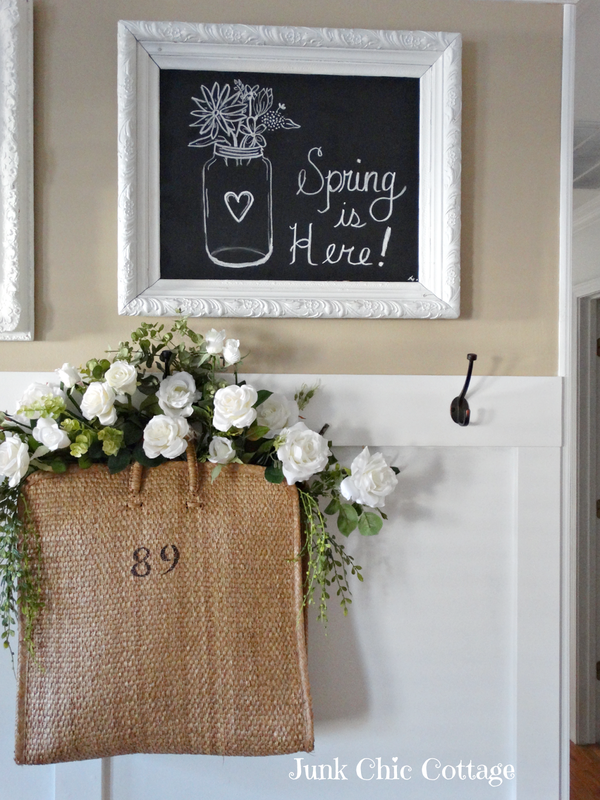 Your entryway is ready to greet your spring visitors with your fun chalkboard art, too! I haven't seen a water crate like that in years. What a great container for flowers. I love your little chalkboards. And, I am going to copy your idea of the bag with the number. I have a plain burlap bag and it is going to get a stenciled number today! The water bottle and crate are a treasure of a find. So much meaning. Just the knd if piece if history that I adore. Lucky lucky you! You simply are too sweet! Thanks Christine. Have a wonderful start the new week. That bottle was a terrific find! Love the crate too. 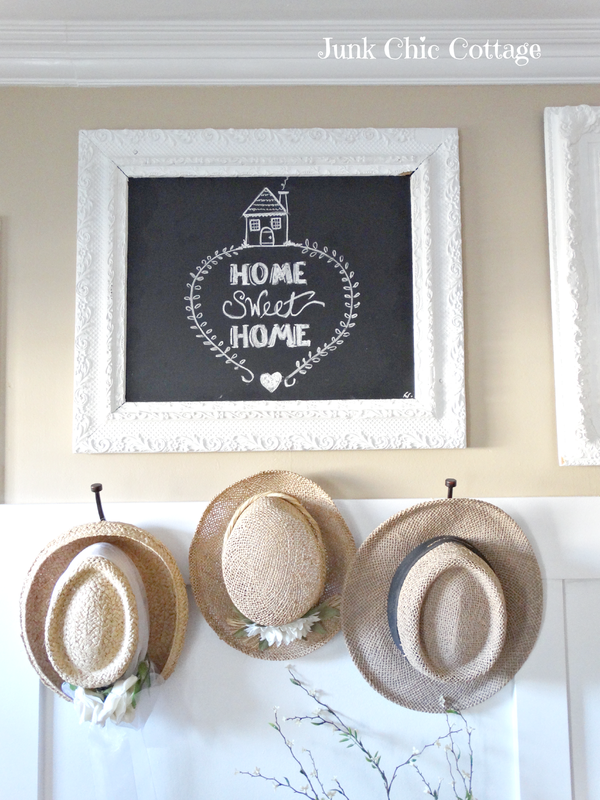 Your chalkboard signs are darling and I love how you can change them up for the different seasons. I finally got my Easter decor out today. I didn't realize it's so close to Easter! What a wonderful find and it looks great in your entry! When is your actual birthday girl? Your entryway gets better and better, Kris! That bottle in the crate is fabulous!! 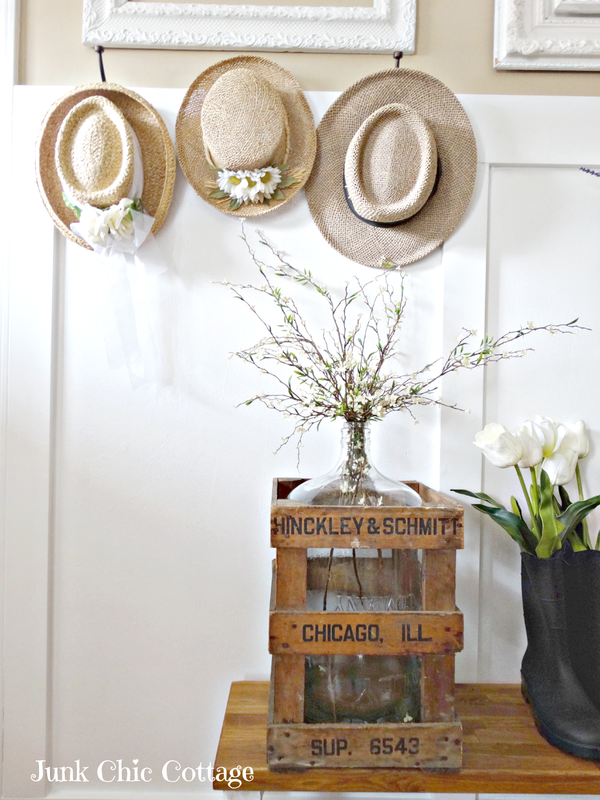 i adore your entryway transformation! The addition of the vintage water bottle and carte is beyond beautiful! love..love!! What a great find! Don't you love when that happens!? it's perfect for your entry. it's looking great! can't wait for the living room reveal. I just know it's going to be fabulous. What a great find Kris. I don't think that I have ever seen one of those, but I love it! Your entry way is perfect! We are having decent weather also. Love it!! What a great find!! It looks great in your entry way. What a fabulous find!! Happy early birthday present to you. Love your chalkboards. So pretty Kris! I love the board and batten, the chalkboards, the bottle, and the bag with flowers. You are so talented. Your foyer is ever so pretty, and what a truly fabulous find. I wish the Charmer was larger so I could have pieces like... I guess I'll just admire them over at your place. Cool birthday gift! I remeber that we have the same birthday month :) Your foyer looks so nice. The chalkboards are great. I really should have one in my home. Your entry looks amazing and I really like your birthday present! That was a nice early birthday gift! I love it! I have one as well, and I was tickled to find it. They can be difficult to find. I like how yours has your town name on it too. You and your husband seem like such a happy team! Happy Early Birthday! My Bday is in April, too. I said after 50 that I would celebrate the entire month! I never thought of starting in March! LOL! But, my sweet hubs always says, "yes", too. Your style is so pretty - and I love to look at your beautiful home. Is there a certain height that the paneling should be on your walls? I've been asking hubs to do this for me in our dining room. So very pretty, Kris! LOVE that straw tote! Wherever did you get it? I might need one!! Thanks so much for sharing! The vintage water bottle and crate are perfection! Kris, your entry looks wonderful and you are lucky to have found such a great water bottle inside it's original crate....it is a beauty!!! Love it Kris! I have always wanted one of those too! Oh Kris - what a fabulous find ! Your entry way is just beautiful - I love what you did with those chalkboards - you're such an inspiration, truly ! Beautiful! I am an April baby, as well. The chalkboards look fabulous Kris! And that water bottle is such a great find. What a fun find. Happy early Birthday. Love your welcoming chalkboards Kris. Great find too and even better that it's from a local source. Enjoy the warmer temperatures! Did Terry make the chalkboard graphics. I am wanting to make one for my laundry room, don`t know if it will print off on my computer. I was thinking I might need to take it to the office supply store for laser printing. Hi Kris, I love the water bottle you found and it looks so nice in the entryway with the chalkboard art! Hope you have a wonderful week coming up! You have the most delightful entryway! It's so fresh and cute. And the chalkboard frames are wonderful too. I have a turquoise, [of course] version in my studio. What a lovely entry! Bet it makes you just go "ahhhhh" every time you walk in the door! I remember the commercials for Hinkley and Schmidt from when I was a kid! Fun find girl! I love it Kris! It certainly is a great find and looks right at home in your gorgeous entry! Oh, how I love coming here! So pretty, Kris. Sweet birthday gift, too! I'm late, Kris, but I just love that water bottle & crate! What a treasure, especially since it reflects the Chicago area. I love the chalkboards too! I think it's important to have inspirational messages scattered around...little reminders of good thoughts and blessings! Just beautiful. As always!!! I'm catching up my emails today Kris. Don't worry about responding to me every time. Love ya!